NOT A SPLINT BOOT! NOT A LEG WRAP! ITS A SUPPORT BOOT PERFECTED! Iconoclast® Orthopedic Support Boots feature our patented Double Sling Straps® for unparalleled lateral support. With its evenly distributed support to the suspensory branches, Iconoclast® is the only boot that truly lifts and cradles the equine leg. Designed to reduce joint interference and restriction, this is the perfect all around boot for every equine discipline. Designed to use every day while riding to aid in the prevention of soft tissue damage of the lower legs, Iconoclast® Orthopedic Support Boots will help your horse feel more confident with each step he takes, in and out of the arena. Choose between our selection of hats. They have an adjustable backing to allow a one size fit all. Use this rubber horn cover to protect or reinforce your horn. Rubber cover comes wrapped around plastic to provide easy application on your horn leaving a strong lasting cover. Sliding ear piece stainless steel (S.S.) domed Chicago screw headstall. Our headstalls are made from the same quality top grain skirting leather used on our saddles. Fleece Cinch by Toklat, Brown nylon webbing with 100% wool backing. Stainless steel hardware. Sizes Available: 24"-32"
Current rating is 3.67. Total votes 6. SA Walls Slanted Stirups allow the rider to keep their feet flat and parallel with the ground providing more relief on the hips and knees. The stirups are light weight and built with quality aluminum for added durability and life expectancy. Current rating is 3.17. Total votes 6. Current rating is 4.13. Total votes 8. Our arena bag's come with a heavy duty fabric and thick stitch. With the main pouch built with a mesh bottom and 4 additional side pockets allows you to pack all your arena gear in one bag. Our versatile bag comes in a variety of colors to match your needs. 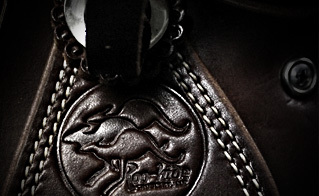 Our Breast Collar's are made with the same fine quality leather that our saddles are made from. Set of six 1.5" Hand engraved brass and copper concho. Leather money clip with basket stamp. Offered in two colors.